WOW!!!! This font is beautiful. DBW01, I looked and it appears that the wider letters (the M, for instance) are just a touch too large for a 4" hoop (the M is 103 mm wide, and 4 inches is about 100 mm) but they are all about 75 mm high. 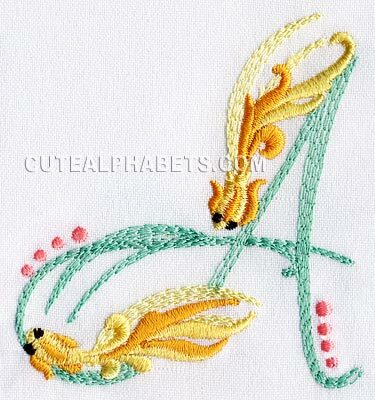 Lovely alphabet! This gold fish font is so pretty, I think I just might have to order this. this is lovely. The design of the gold fish are so Asian, this really excites my creative mind. Humm what to do first.. Carylscreations towel wrap?? I just ordered this font and can't wait to use it.